Sometimes, it’s the little things that matter; the attention to detail. I was testing out a hammock the other day that had a zippered bug net, but visibly missing were adequate zipper pulls. To clarify, the metal zipper tabs were there, they were just a little hard to find and grab, especially with gloved hands, or in low light when I’m fumbling around looking for a quick exit. This wasn’t the first time I’ve been in a hammock that lacked good zipper pulls, in fact most hammocks lack this useful accessory[1. To be fair, tents often omit them too :)]. Oh, the inhumanity! 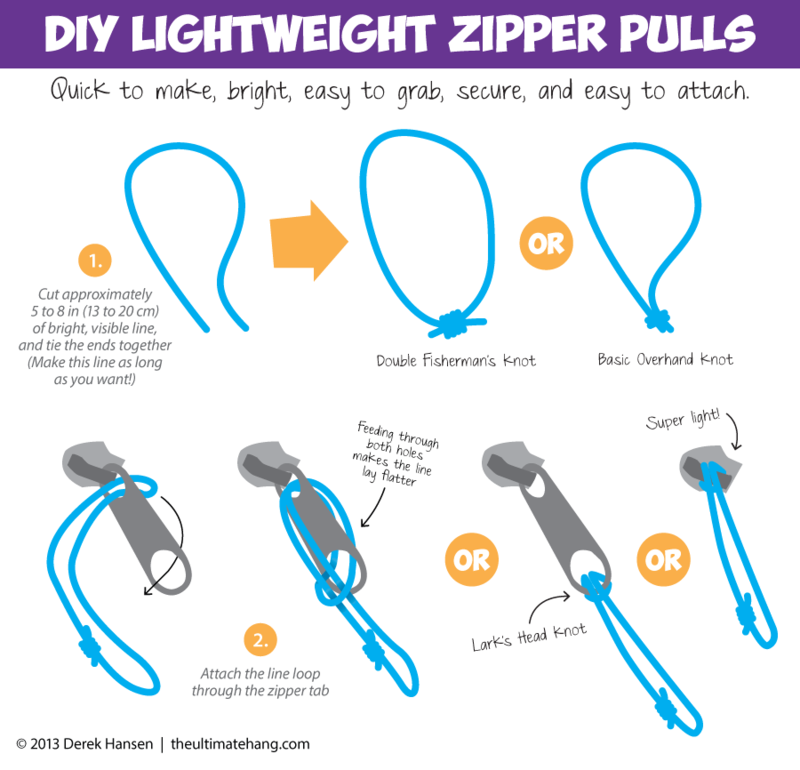 I’m on the fence whether or not a “good” zipper pull requires a reflective tracer or phosphorescence. In my experience, glowing cordage (e.g., tracer or plastic fob) fades quickly (and isn’t that bright to begin with), and reflective tracers only work when light shines on them. To be honest, I don’t often have a light at the ready once I’m tucked in for the night and I’m looking for the bug net zipper. Besides, why use something expensive, bulky, and heavy, when simple works great? Go for bright, high contrast colors for best visibility[2. Colors opposite on the color wheel provide the best contrast. If you have gear that is dark green, then a bright red or orange works. Gear made with bright yellow fabric would benefit from a dark purple. Generally speaking, if your gear is dark, use light cordage. Light gear? Go dark. ], even in low light. I prefer inexpensive bright neon yellow or orange braided mason line[3. 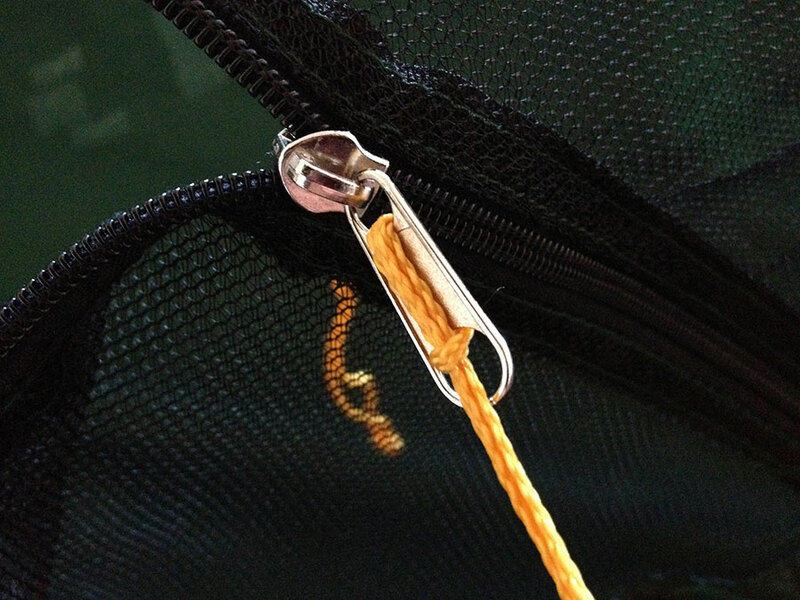 For the price of a few, or one manufactured zipper pull–around $8–you can get 500 ft (152 m) of braided mason line that can be used on other projects, like tarp guy lines]. 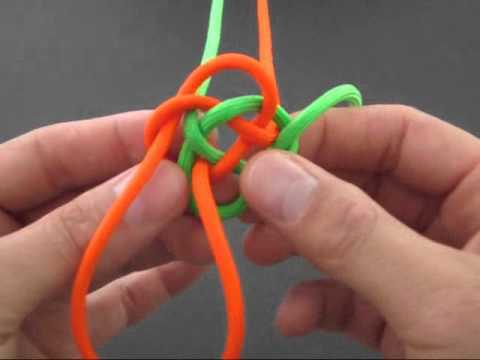 Cut a length of line (I use anywhere from 5 to 8 in) and tie a knot with the ends (a Double Fisherman’s knot works well, or a simple overhand knot). You can tie the line directly to the metal zipper tab, but I prefer to loop it through one or more holes in the zipper tab with a Lark’s Head knot. Problem solved. Crisis averted. Humanity saved. This isn’t rocket science or earth-shattering, but I hope it is helpful to some. UPDATE: Chris F. had a great idea if you want to add some style to this simple zipper pull: tie a two-strand diamond knot on the end! Sweet!